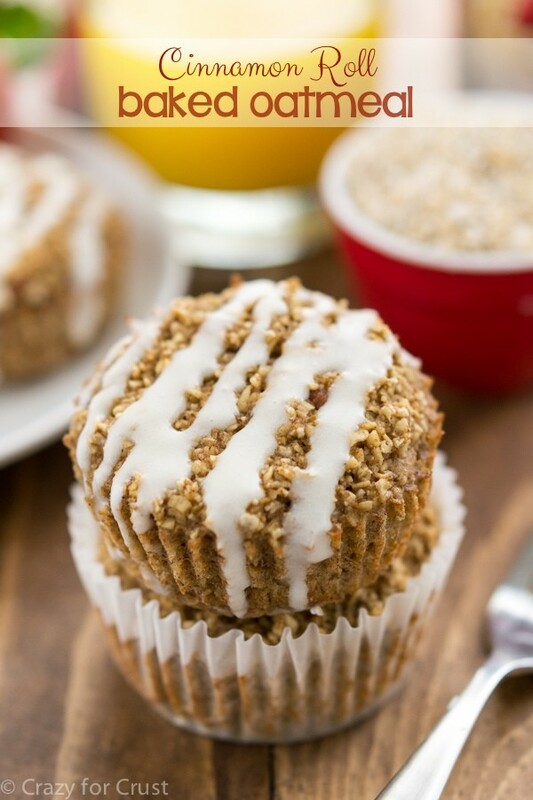 Cinnamon Roll Baked Oatmeal Muffins are an easy and healthier breakfast recipe. 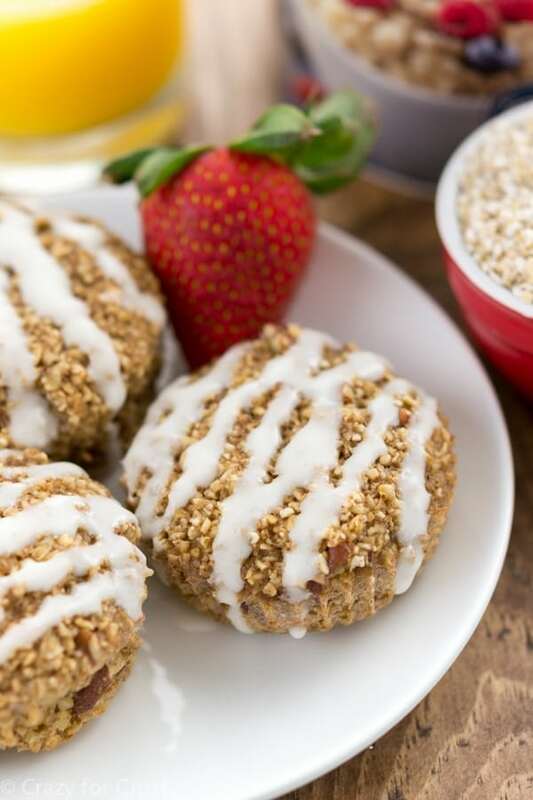 Baked oatmeal is always delicious, but turn them into baked oatmeal muffins and they’re perfect for breakfast or snack – and the kids will love them. As you might remember from my past posts, I am always on the lookout for great second breakfast options. A second breakfast is the meal I eat after I work out. You see, I’m not hungry in the morning. Mornings are also super rushed with work and getting ready for school so I usually make myself a smoothie. That fills up my stomach just enough so I can get in a good hour workout. Then I’m famished and want to eat my kitchen, which is where second breakfast comes into play. I struggle with what to eat for my mid-morning snack. I know I should eat an apple or a handful of strawberries. Those never appeal to me (or fill me up). After I exercise I want real food. I want to chew. I want something that will taste good and keep me full until lunch. I’ve tried all the oatmeals before: instant, quick-cook, regular. They’re occasionally doable, but they were never something I really wanted to eat. When I made healthier blueberry baked oatmeal and Cinnamon Sugar Baked Oatmeal, I fell in love with oatmeal I very much enjoyed the texture of baked oatmeal and it was a perfect in-between meal for me. That’s when I decided to give baked oatmeal muffins a try. It was easy to turn my regular baked oatmeal recipe into a chocolate chip muffin, using old-fashioned oats and chocolate chips. Then when I was out shopping recently I discovered that quick-cook steel cut oats are a thing. I actually prefer steel-cut oatmeal to regular (if I were to prefer oatmeal) so seeing that quick-cooking ones were a thing got me to wondering if making baked oatmeal out of them would work. I decided to make my easy baked oatmeal with applesauce and turn them into muffins. I made them cinnamon roll so I could add icing. Every cinnamon roll needs icing and the kids will be more tempted to eat them with that drizzle of frosting on top. 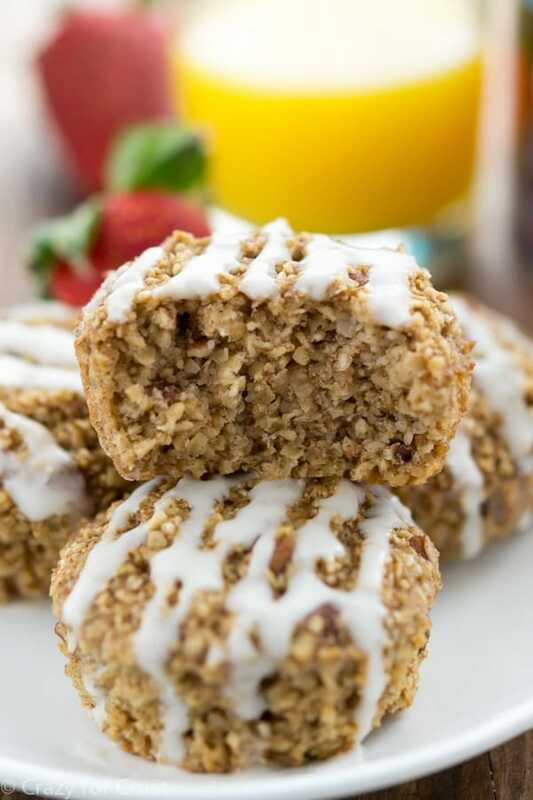 Baked oatmeal muffins are the perfect healthier breakfast. They’re quick to make and easy to pop into a lunchbox or grab for on-the-go. I also love freezing them; I make a batch and then freeze them so I can easily grab a baked oatmeal cup for breakfast or second breakfast anytime. Just heat in the microwave and serve! Can you make oatmeal in the oven? YES! Can you make oatmeal into muffins? YES! This is a delicious way to eat your oatmeal – and you can make this recipe with old-fashioned oats OR quick-cooking steel cut. How do you make baked oatmeal muffins? It’s really simple. All you have to do is mix all the ingredients together in a bowl and then bake it. There is no butter or oil in this recipe – all that is replaced with unsweetened applesauce. That makes these much healthier than a traditional baked oatmeal. Be sure to spray your muffin liners well with cooking spray. Since there is no added fat to the recipe, they’ll stick to the papers. You an also just grease your muffin pans and skip the liners, if you prefer. 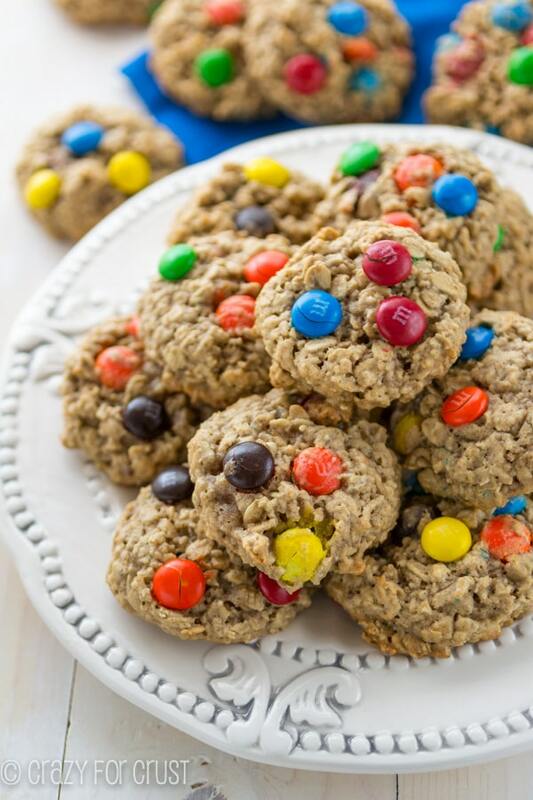 You can use quick cook steel-cut oats OR old-fashioned oats in this recipe. These are hearty little baked oatmeal bites. They’ll fill you up for sure! Freeze them for quick mornings, or pop them in lunch boxes for a mid-morning snack. I liked them best a little warmed up in the microwave, then drizzled with some icing. If you want to make a large pan of this instead of muffins, you most certainly can. Spray a 9×13″ baking pan with cooking spray and bake 20-30 minutes. This Cinnamon Roll Baked Oatmeal is perfect for on-the-go breakfast! It's an easy recipe that's fast and hearty and will stay with you all morning. Preheat oven to 350°F. Line muffin pans with liners and spray very well with nonstick cooking spray. Stir eggs, applesauce, sugar, 1 teaspoon vanilla, cinnamon, salt, and baking powder in a large bowl until mixed. Stir in oats and milk. Fill muffin cups 3/4 full. Bake for about 20-25 minutes until they get golden brown and no longer look wet in the center. Make the glaze: whisk powdered sugar, 1/4 teaspoon vanilla, and milk. Drizzle over oatmeal. Serve warm. Store in an airtight container for up to 3 days or freeze for up to 1 month. Microwave to reheat for fast morning breakfasts on the go. Just made a batch and they are delicious!! Thanks for the recipe! 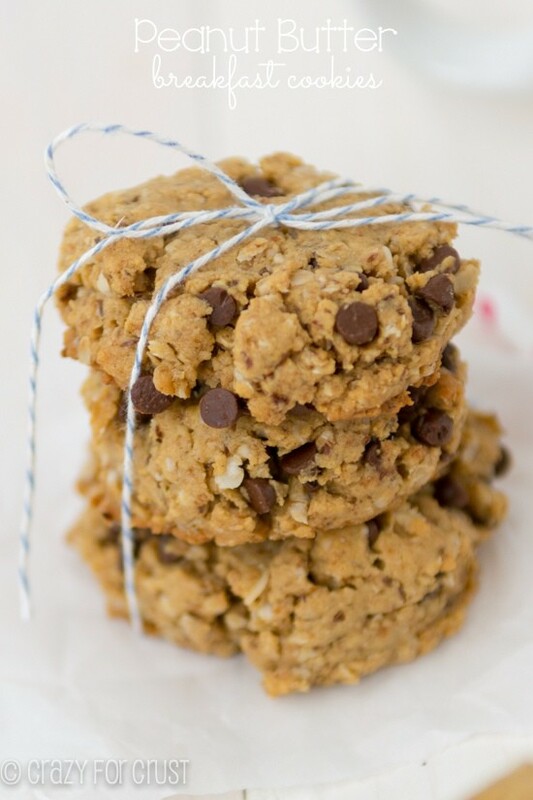 I made these with normal steel cut oats, soaked them overnight and then baked in the morning. I also halved the milk and replaced the half with apple cider. Because I soaked them overnight, I only did two cups of steel cut oats because I knew it’ll soak up some of the liquid. I also added nutmeg. Now THAT was delicious! Thank you! I’m in love with the Cinnamon Roll Baked Oat Muffins! 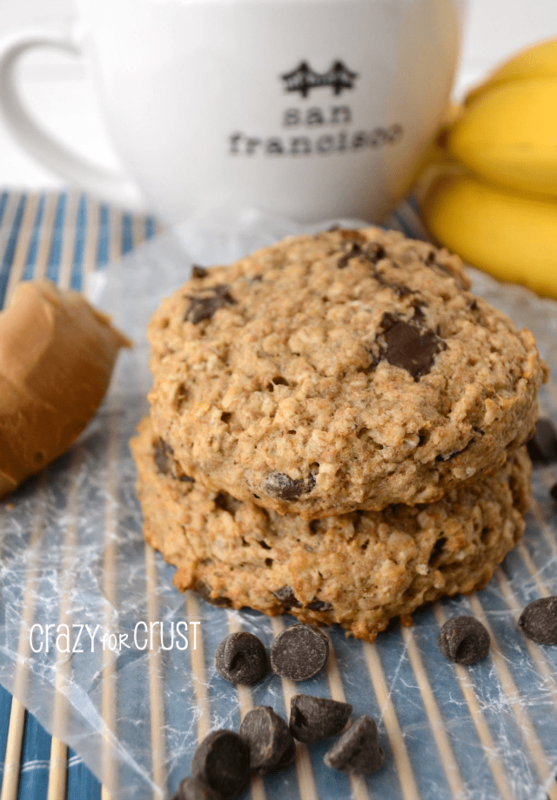 They’re perfect for breakfast on the run…..every morning! The baked oatmeal cinnamon roll looks delicious! Will be trying it soon, thanks for sharing!